Organisational culture describes how things get done in an organisation – in terms of the values, behaviours and assumptions which dictate the way people approach their work. Organisational culture is deeply embedded and is distinct from climate. Culture affects performance, profit and even survival. We use the Human Synergistics Organisational Culture Inventory, which incorportates the Circumplex model, to measure organisational culture. Achieving a constructive culture is a key aim of most change management programmes. Constructive cultures place an equal emphasis on getting the job done and the needs of people. This balanced approach values achievement and accountability while also emphasising the need for teamwork and effective leadership. Passive defensive cultures tend to maintain the status quo and struggle to bring about constructive change. Rules may be considered more important than ideas; there can be an aversion to risk-taking and difficult problems are often avoided. In a passive defensive organisation people don’t want to rock the boat. Where aggressive defensive cultures are found, the emphasis is on forceful behaviours. Less value is placed on people, blame cultures frequently operate and turf wars can drive decisions. While some success may be enjoyed in the short-term, this culture has a damaging effect on long-term performance. Adaptive cultures promote innovation, moderate risk-taking and candid discussions. They place equal emphasis on customers, shareholders and employees. 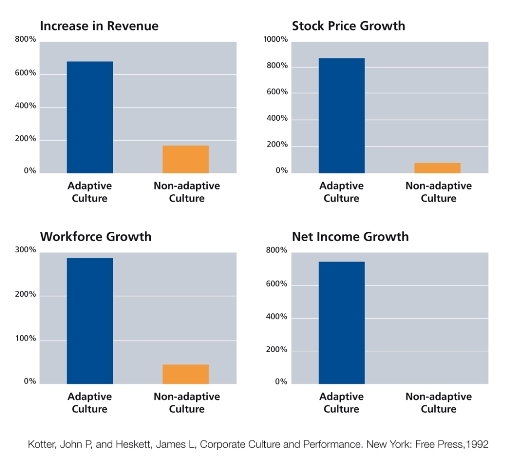 In an eleven year study of 207 large organisations, Kotter and Heskett demonstrate the positive effect of an adaptive culture on performance. They argue that only cultures which help organisations anticipate and adapt to change will be successful over the long term. ² Interview with Diane Vaughan into causes of Challenger and Columbia shuttle tragedies. Also, report into BP/Transocean oil rig disaster in Gulf of Mexico.